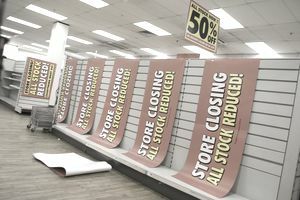 The retail sector announced 41,201 job cuts in the first two months of 2019. This is 92% higher than in the first two months of 2018, according to a report by Challenger, Gray, and Christmas, Inc., a global outplacement and executive coaching firm. (2019 February Job Cuts: U.S. Employers Announced 76,835 in February). What are workers who have made their living in retail jobs to do? If you work in a store and lose your job, is it prudent to look for a new job in a similar establishment? While you might be able to find one, you have to ask yourself how long you will be able to hold on to it. Rather than hopping from job to job at one failing retailer after another, a more productive option is to transfer your skills to other occupations and industries that have more promising job outlooks and prospects. You will also want to utilize your strengths which, as a retail worker, are excellent interpersonal, listening, and verbal communication skills. Consider the following careers that also require those attributes, but require limited training. The U.S. Bureau of Labor Statistics (BLS) classifies them as "Bright Outlook" occupations due to the large number of job openings the government agency predicts they will have over the next several years. Job Description: Bartenders take and fill customers' drink orders. This usually includes preparing cocktails—mixed alcoholic beverages—but may also include making "mocktails" which are mixed non-alcoholic drinks. They also pour wine and beer, check customers' identification for proof they are of legal drinking age, process payments, and keep bar areas neat and clean. Training Requirements: Most employers provide on-the-job training to bartenders, but some will only hire those who have completed a course at a bartending, vocational, or technical school. Programs are typically just a few weeks long. Job Outlook and Prospects: The B.L.S. predicts employment will grow by just 2% between 2016 and 2026. This is slower than the average growth for all occupations, but job prospects will be very good because of the turnover in this field. Job Description: Waiters and waitresses, also called servers, take food and beverage orders from customers in restaurants. They pick up the food from the kitchen and deliver them to the tables. They answer questions about the menu and may recommend particular dishes. Finally, they calculate bills and receive and process payments. Training Requirements: Waiters and waitresses get on-the-job training from their employers. Some restaurants also provide classroom training where they teach proper serving techniques. Job Outlook and Prospects: Employment is expected to grow by 7% between 2016 and 2026—about as fast as the average for all occupations. There will be plenty of job openings thanks to the number of people who regularly leave this field. Job Description: Baristas work in specialty coffee shops. They prepare and serve coffee, other beverages, baked goods, and sandwiches. Training Requirements: Employers provide on-the-job training to baristas. Job Outlook and Prospects: Employment is expected to grow by 14% between 2016 and 2026. This is faster than the average for all occupations. Many job openings will be available. Job Description: Customer service representatives take orders, resolve complaints, and answer questions from customers. Most of their interactions take place over the phone, by email, or through live internet chat. Training Requirements: Most jobs require only short-term on-the-job training. Job Outlook and Prospects: B.L.S. forecasts indicate that employment will grow by 5% between 2016 and 2026—faster than the average for all occupations. Job prospects will be good. Job Description: Medical assistants, depending on where they work, perform clinical and administrative tasks in physicians' offices. They greet patients, record medical histories and vital signs, and make appointments. Training Requirements: Some employers will provide on-the-job training, but many will only hire job candidates who have completed post-secondary education. Job Outlook and Prospects: Employment is expected to increase by 29% between 2016 and 2026, which is much faster than the average for all occupations. Job prospects should be good, especially for those with certification and familiarity with electronic health records. Job Description: Receptionists greet visitors, schedule appointments, and direct telephone calls to the proper recipients. Training Requirements: Employers provide on-the-job training to receptionists, but some will only hire candidates who have experience using word processing and spreadsheet applications. Job Outlook and Prospects: The B.L.S. predicts employment growth of 9% between 2016 and 2026, as fast as the growth for all occupations. Job prospects will be good, especially in the healthcare industry. Job Description: Provides personal services to hotel guests, apartment building residents, or workers in an office building. Training Requirements: Most employers provide training to new hires. Job Outlook and Prospects: At 11%, employment growth is predicted to be faster than the average for all occupations between 2016 and 2026. New jobs should be plentiful. Job Description: Personal care aides provide non-medical services and companionship to individuals who are ill, elderly, or have disabilities. They clean, cook, and drive. Training Requirements: Training is usually done on-the-job. Job Outlook and Prospects: Employment growth is expected to grow much faster than the average for all occupations: 41% from 2016 to 2026. Job prospects will be excellent. Sources: Bureau of Labor Statistics, Occupational Outlook Handbook, 2017 and Occupational Employment Statistics, 2018; National Center for O*NET Development, O*Net Online, 2019.